I "liked" you on Facebook, so others can find you too! I like the idea of more fabrics to mix together in a quilt. So I would love 8 1/2 yards. I would like 4 full yards! i'm now a twitter follower too! and i "liked" you on FB too! I would probably choose 4 one yard cuts! I'D CHOOSE THE 4-1YD CUTS! THANKS FOR SUCH A SWEET+GENEROUS GIVEAWAY! I follow your blog through my blog links because I never want to miss one of your emails. and I tweeted about it. I would to win the 1/2 yard bundle please. I love this fabric. I would love the 8 half yard cuts! 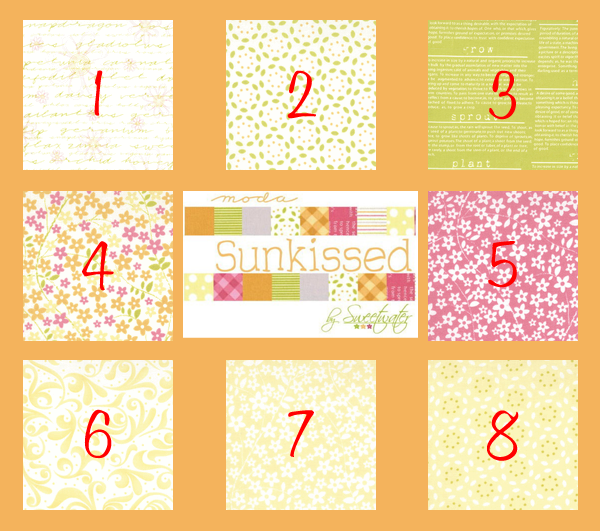 I love the sunkissed fabrics and I couldn't pick so I would say 8 half yard cuts. I follow you on Facebook & if I should win, I would like 8 1/2 yard cuts. I would use them to make a quilt top. I love everything moda! I'd love to win the half yard cuts - lovely light and airy prints! I am a facebook follower and love all of the info ! I tried to post and my name did not show up ? 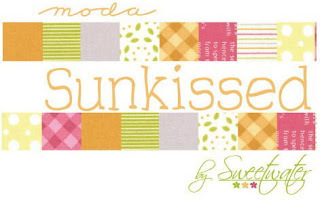 I am a face book follower and am new to the blog..love it! I would love to win the 8 half yard cuts! I would love to win either one. The half yard cuts of all 8 would be great, but I like fabrics 2-5 really well, so yard cuts of those would be great, too. Either one. I would love the half yaed cuts. THey are all beautiful fabrics! I would love to win the half yard pieces - there is still plenty of fabric in these to make many things! I would love to have the 1/2 yard pieces. I use a lot of smaller pieces in my crazy quilts. What a hard choice! I think I'd like the 8 half yard cuts best! thanks! I'd love to win the Four 1 yard cuts. What I don't use, I'll donate to my local Quilts of Valor group that I sew with. I'm currently making string quilts to use up all of our scraps so they don't go to waste. Check my blog and you'll find a link to our local group, Land of Lincoln Quilts of Valor. what a sweet giveaway..^^ i'd love win the eight half yard cuts.. I would choose the 1/2 yard cuts. Thanks for the gorgeous giveaway. Hi I've just found out about you. Thanks for having a giveaway for your grand opening! I'd love to have eight 1/2yard cuts. I'm following you on twitter and have signed up for your newsletter too. I would like to win 8 1/2 yards. Beautiful fabric!! I "like" the facebook page! I would love the 8 half yard cuts, I love the different color variety, and half a yard can go a long long way in a quilt. Thanks! and happy birthday tomorrow! I'd prefer 8 half yards and I signed up to follow you on Facebook too! Not sure how I'd missed you on there!! I would love to have 1/2 yd pieces of each print in this happy collection! Thanks for the great giveaway! I just signed up as a follower!